A dental implant is an ideal tooth restoration for people who are missing one or more teeth as a result of injury, periodontal disease, or any other reason. A dental implant is a titanium post that a periodontist or oral surgeon surgically positions into the jaw where your tooth root was. The implant integrates with your bone and functions just like your natural tooth. 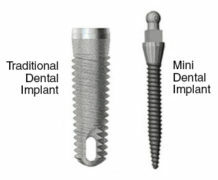 Mini dental implants are among the newest innovations in restorative dentistry. Over the past several decades, mini implants have become increasingly popular options for patients looking to replace one or more missing teeth. 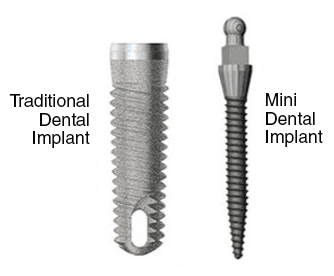 Both mini and traditional dental implants are devices used to fill the gap created when a natural tooth is missing. Each is topped with an artificial tooth, or crown, to replicate the appearance and function of a tooth. Preserves bone and facial structure. Some implants can be placed at the time of tooth extraction depending where in the mouth the tooth is being replaced. When the implant is placed it needs time to integrate with your bone for 2-6 months before a tooth can be attached. There are basically three pieces to each implant: the implant which is like the root of the tooth, the abutment which is the post and the crown which looks like the tooth. Implants look, feel, chew and floss like a natural tooth.